Spring is an exciting time of year. It just so happens to be the start of farmers’ market season. Local outside farmers’ markets will often run early May to late October. Although there are some indoor markets open all year long, early May is when we often see certain spring vegetables and herbs we’ve been waiting to buy for months, and in some cases almost a year. For me, the farmers market is my home away from home. Over the past five years or so, I’ve developed relationships with several local farmers and organic vegetable growers. This practice has allowed me to become closer to my food, while understanding more about the farmer’s growing practices and where my food comes from. There is nothing better than eating food that was sometimes picked a day before consumption. You can’t get any fresher than that! Each farmer works incredibly hard to grow delicious vegetables and herbs. The least I can do is purchase and enjoy their produce for my daily meals. Although I have a few favorites, I often support a variety of farmers because they each seem to have different foods to choose from. What is good about eating for the season is your menu at home will adapt and expand due to the spring foods you’ve been waiting for all year. I’m excited to share my favorite spring vegetables and herbs from local farmers’ markets with you. In fact, some of them are only available for few weeks, so if you if you see them, you better stock up. Here are my top 10 spring vegetables and herbs that I’m currently buying at my local markets. Between April and June, wild leeks make a brief appearance at farmers’ markets. When I see them, I have to have them. They are also called ramps, wild garlic, and wood leeks. They also have the plant name Allium tricoccum, and they belong to the onion family. Wild leeks are truly a chef’s dream, and although they resemble the green onion in appearance, they have a uniquely pungent and delicious garlic-onion flavor that is quite tasty. Wild leeks contain many of the same compounds as garlic, including kaempferol and allicin. You can easily substitute wild leeks in any recipe that calls for garlic or onion. Ramps are especially delicious in homemade pesto. They also contain lots of antioxidants, especially vitamin A, vitamin C, selenium, and polyphenols. As a result, many of the nutrients in wild leeks can help treat and prevent cancer, support brain function, and benefit heart health. Spring garlic, or green garlic, is another food I find during early springtime. It is younger garlic that is collected before the cloves become a fully mature bulb. Spring garlic contains similar benefits to mature garlic because it contains the sulfur compound, allicin. As a result, this spring food is great for boosting immunity and fighting gastrointestinal infections. The polysulfides in spring garlic also help protect against heart disease. I add spring garlic to salads, stir-fries, pesto, or sauté it and add to potato and pasta dishes. Fiddleheads are only available for a short time in the spring between late April and early May. Often, they are only available for a week or two, so I always get them when I can. They are the unfurled fronds of a young ostrich fern. Once they uncurl, the fiddleheads are ready to be harvested. Fiddleheads are also very nutritious as well and contain antioxidants, fiber, iron, and omega-3 fatty acids. Fiddleheads are also easy to prepare. I like to steam them for a few minutes and sauté with some garlic and olive oil. Spring is an excellent time to get some asparagus spears (Asparagus officinalis). Asparagus season is also very short and often lasts from last March through May. After that, asparagus must be flown in from other parts of the world. Consequently, this greatly affects the quality of the asparagus flavor since it tastes best when eaten within a couple of days of being picked. Asparagus is loaded with nutrients, especially vitamin K, folate, vitamin A, and vitamin C. Asparagus also contains the antioxidant glutathione that helps detoxify the body of toxins. It is also a natural diuretic that prevents kidney stones and nourishes the digestive system. I like to steam asparagus, then roast them with some lime juice, shallots, cherry tomatoes, and dried herbs. Rhubarb is another food that’s available for a short time at farmers’ markets. Although many people think it’s a fruit in rhubarb pie or jam, it is actually a vegetable used for a variety of delicious and unique recipes like rhubarb vinaigrette salad dressing or rhubarb salsa. This vitamin-K rich vegetable is beneficial for digestive symptoms like constipation and diarrhea. It also strengthens bones and reduces inflammation. Baby bok choy is among the first crops at the tables of farmers’ markets. Bok choy looks similar to celery, but it is part of the cabbage family. For centuries, bok choy has played a major role in traditional Chinese medicine, and it was originally cultivated in China during the Ming dynasty. Boy choy is loaded with vitamin A, vitamin C, and vitamin K. Baby bok choy is more tender and smaller, and it is delicious steamed and sautéed whole or added to soups and stir-fries. For optimal freshness, avoid washing bok choy until it is time to use it. Snap peas (Pisum sativum), or sugar snap peas, are like other peas in that they are edible pod fruits. They are a wonderfully sweet and crunchy food that often shows up at the farmers’ market near the end of spring. Snap peas are a great source of vitamin C, vitamin K, folate, iron, and manganese. They can be eaten raw, or served in salads, pickled, roasted, steamed, or used in stir-fries. Before using, you must remove the top of the pod from the base to the tip. The radish (Rahphanus raphanistrum) is a crunchy root vegetable from the Brassica family, and it is mostly consumed raw in salads. There are numerous types of radishes that vary in flavor, size, and color, as well as the length of time it takes for them to mature. The average radish is round and red, with a white interior, and is about the size of a ping pong ball. Other varieties will come in purple, pink, dark gray, yellow, and two-tone green and white. Many types of radishes begin to come in season in spring around May. Radishes, in general, are a great source of vitamin C, fiber, folate, vitamin B2, and potassium. In general, dark green leafy vegetables are readily available locally throughout the year at some indoor markets due to greenhouse-grown greens. With that said, shortly after farmers’ markets open, there is a larger selection of dark leafy greens, including fresh spinach and arugula. Both greens are incredibly high in antioxidants and other disease-fighting nutrients. Fresh greens are excellent for salads or sautéed for delicious sides or stir-fries. I saw a large bin of stinging nettle (Urtica dioica) at one of my regular farmers’ market spots recently. Stinging nettle has been used medicinally dating back to ancient Greece, and it makes for a great tea. You can also cook stinging nettle leaves in a similar way to spinach and add it to stew or soup. Some recipes also call for stinging nettle in pesto, salads, and smoothies. I also get excited when I see other fresh herbs at markets, including parsley beginning around April. Sage, dill, and thyme show up in May. Although artichokes will show up at the grocery store throughout the year, spring is when artichokes are freshest. Globe artichokes are something to relish when cooked right. For first-timers, cooking an artichoke may be intimidating, but the end result is worth it. They can be steamed or boiled before roasting them in the oven with some olive oil and herbs or grilled for a few minutes on the barbecue. Once you’ve tasted artichokes, it is hard to pass them when you see your local farmer selling them. Fennel season comes to an end around early spring, so it’s an honorable mention on this list to get you to purchase some before you have to wait until fall. Peak fennel season is fall through early spring. You can slice this anise-flavored bulb for salads, roast it to bring out its sweeter flours, or combine it with other vegetables and fruit to make fresh juice. The entire fennel bulb, including stalk, leaves, and seeds are edible. Fennel is known for key nutrients, including vitamin C, fiber, and potassium. An important fact about fennel is that it can stay refrigerated for around four to five days. After that, it tends to lose its flavor. From buying fresh produce to meeting those that grow your food, there are countless reasons to support farmers’ markets. Foods from farmers’ markets also travel shorter distances to get to your plate. Locally grown foods tend to have greater nutrient content than typical store-bought produce that spends weeks and sometimes months in a transport truck or warehouse before reaching the grocery store. One to two days after harvest, leafy vegetables lose up to 90% of their vitamin C content after harvest. So, what are you waiting for? 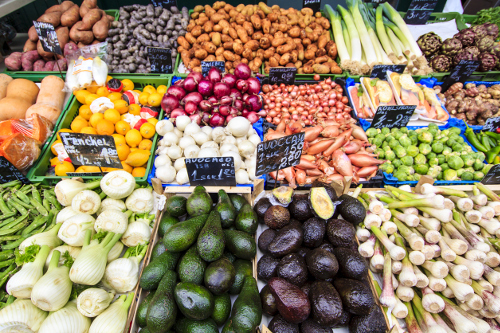 It’s time to get to the farmers’ market and select some of my favorite vegetables and herbs, such as wild leeks, spring garlic, asparagus, fiddleheads, rhubarb, bok choy, arugula, stinging nettle, and artichokes. Saturday is often my day to shop the markets. Check online for information on the when and where of your local markets. Engels, J., “10 Fruits and Vegetables to Look for in Early Spring Farmers’ Markets,” One Green Planet, March 20, 2017; http://www.onegreenplanet.org/lifestyle/fruits-and-vegetables-to-look-for-in-early-spring-farmers-markets/, last accessed May 11, 2017. Coles, T., “Seasonal Foods: 15 Healthy Foods To Buy In Spring,” The Huffington Post Canada, November 22, 2013; http://www.huffingtonpost.ca/2013/04/15/seasonal-foods-spring-2013-_n_3086119.html,. Alterman, T., “Spring Foods: Fruits, Vegetables and Herbs in Season Right Now,” Mother Earth Living, March/April 2012; http://www.motherearthliving.com/sustainable-food/spring-foods-zmoz12mazmel, last accessed May 11, 2017. “The Spring Foods We Can Hardly Wait To Eat (Photos),” The Huffington Post, March 6, 2013; http://www.huffingtonpost.com/2013/03/06/spring-foods-photos_n_2813963.html, last updated Oct. 1, 2013. “Health benefits of Green Garlic,” HealthBenefits Times; https://www.healthbenefitstimes.com/health-benefits-of-green-garlic/, last accessed May 11, 2017. Roberts, A. M., “Spring Vegetable to Try: Green Garlic,” POPSUGAR, March 7, 2012; https://www.popsugar.com/fitness/Health-Benefits-Green-Garlic-22076848. “Benefits of Sugar Snap Peas,” SFGate; http://healthyeating.sfgate.com/benefits-sugar-snap-peas-6013.html, last accessed May 11, 2017. “What Are Radishes Good For?” Mercola; http://foodfacts.mercola.com/radish.html, last accessed May 11, 2017.